This page of my Encyclopedia is devoted to tasting whisky with Master of Malt. 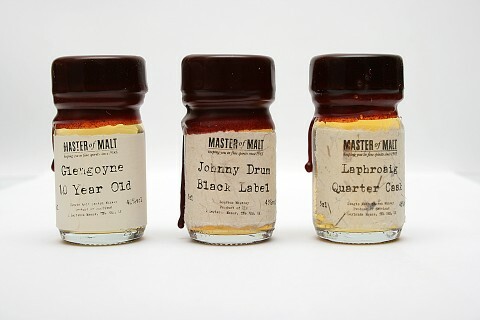 * This is a review of a sample of Laphroaig Quarter Cask by Master of Malt. A bit of history: The history of Laphroaig, a legendary Scottish distillery began in 1815. Two brothers – Alexander and Donald Johnston founded it on the Isle of Islay and their successors ran it up to 1887 when the Hunters overtook the distillery and operated it till 1954. The further growth of Laphroaig was supervised by such corporations as Alled Domecq and Fortune Brands. On-the-record: It is reported that the crafting of Laphroaig Quarter Cask Single Malt Whisky was carried out as a tribute to the two hundred year long tradition of producing high-quality malt whisky by Laphroaig Distillery. Two hundred years ago whisky was often matured and transported in quarter casks, which were handy for transporting them by mules and packhorses. A quarter cask was smaller than a modern barrel and that is why more contact between spirit and oak timber of the barrel was provided – and that is a key factor in the maturation process. So, the Laphroaig Quarter Cask is aged in a standard barrel and then it gets mature for some 7 months in quarter casks which are placed in the oldest Dunnage warehouse #1, with stone walls and earthen floor which sits right on the seaweed laden foreshore. 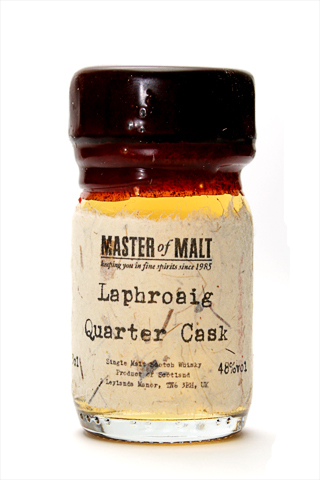 In spite of a modern marketing tradition Laphroaig Quarter Cask is nas-whisky. Some other interesting details of manufacturing Laphroaig Quarter Cask are, first, the absence of chill-filtering process to prevent aroma and taste loss and, second, high-strength bottling. The strength of the whisky is 48% abv or 20% higher then to standard strength. It is worth mentioning here that famous whisky expert Jim Murray gives Laphroaig Quarter Cask 95 points out of 100 (Jim Murray describe whisky with score from 94 to 96 points as ‘whiskies that give us all a reason to live’). My opinion: Actually taking a sip of Laphroaig is one of my old dreams. And it has came true by virtue of Master of Malt. Laphroaig Quarter Cask is very, VERY, VERY aromatic whisky. It has strong potent pungent nose. The main notes are a smell smoke of punky chute and peat reek. It is a terrific nose. But after a while I can feel more subtle notes of chocolate and creamy vanilla. With some drops of water I can feel some other strange notes like a campfire smell, charcoal and smell of a railway sleeper. And my nose catches a wiff of iodine like that of sea air mixed with seaweed and campfire smoke. The taste is quite strong and extremely peculiar. The entry is smooth, sweet and round. The main palate is liquid smoke with notes like burnt barbecue but the palate is surprisingly smooth. In two words Laphroaig Quarter Cask has sweet and smoky palate. The finish has some notes of smoky seafood and a burnt toast. Aftertaste is unthinkably long. Sure enough that the aftertaste is the longest in all my lifetime. The main notes are peat smoke and a slight note of kreosote. Undoubtedly, it is a great experience. I have never tasted anything like this. Really I love it! It is awesome whisky and I think that we meet with Laphroaig quite soon. Mixing: As I wrote, single malt scotch is not for mixing. The range of cocktails with single malt scotch is quite narrow and most of cocktails are not quite interesting. But as an exception to the rule we have some interesting cocktails with peatest and smokiest of scotch – Laphroaig, for example Dreamy Dorini Smoking Martini by Audri Sanders aka Libation Goddes, or Penicillin Cocktail by Sam Ross (but these cocktails require standard Laphroaig 10 y.o.). I have tasted Laphroaig Quarter Cask in famous Smoky Martini. The review of GLENGOYNE 10 Years Old Single Malt Scotch Whisky coming soon! However, you may visit the product’s page at the Master of Malt. The review of JOHNY DRUM Black Label Kentucky Straight Bourbon Whiskey coming soon! However, you may visit the product’s page at the Master of Malt. и в части промо-материалов (как признания твоей деятельности), так и в части долгожданного знакомства с, наверное, идолом шотландского виски – Лафройгом. Теперь тебе точно будет не скучно :-) ! Ну и заодно нам тоже! Тут ты прав, скорее всего. Но в глобальном плане сильной разницы, я неискушённый не заметил между квотером и простой десяткой- хоть она в табели о рангах чуть выше стоит вроде. Молодой Лафройг – он и есть. Отличие от десятки, на первый взгляд, небольшие, в деталях.